National Flag Day in Panama comes with pleasant surprises. I must admit I am not a great flag-waving person. My many years of foreign travel and military service have shown me that flags are not something people are willing to die for – quite the opposite they are in most cases something for which people are willing to kill. On a sunny day in the highlands of Chiriqui Province, I saw something quite different. This was National Flag Day in Panama and, for days previous, cars and businesses had been proudly flying the twin flags of Panama and the province of Chiriqui. But when the parade started in the town of Volcan, the flag that led the parade was neither of these – it was the American Old Glory that proudly fluttered in the warm early morning sun. Another positive observation: a marked absence of alcohol in this parade. There were no beer tents anywhere to be seen. True, I did see the occasional bystander with a beer in his hand, but overall this was a civilized and sober parade. Quite different from just about every other Central American country. 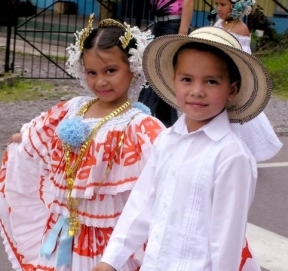 Panamanians are a race apart from the rest of Latin America. True, they are proud, but they are the most outgoing and friendly of all the Latinos I have met. Why? Well maybe because they are the most cosmopolitan nation on the entire continent. When the Panama Canal was built nearly one hundred years ago, workers came from all corners of the globe. Many later settled and became the seeds that have blossomed into the great country that Panama is today. On this day, I watched the flowers of those seeds walk in parade down the main street of this small mountain village. The parade was dominated by schoolchildren, all smartly dressed in sparkling white uniforms – boys proudly strutting and banging the living daylights out of their drums and the girls coyly and cutely swishing by in their beautifully decorated national dress called the pollera. These dresses, dating at least from 1815, when professionally made can cost several thousand dollars. The parade was ushered along by an army of neatly dressed and highly controlling parents. I must admit, I was waiting for something other than the percussive banging of a hundred drums on National Flag Day in Panama. I had seen several young men with trombones and one man with a sousaphone – but no, not one single note of anything melodic arose. Perhaps they weren’t quite ready yet, and the army of mothers and fathers who were the true marshals of this parade would rather have silence than risk a musical embarrassment. The drums seemed to be the thing on this National Flag Day in Panama. I saw two young drummers who were not part of the parade – one, I swear could hardly walk. He must have been about a year old. His father, no doubt, had given the drum to his young son early on Christmas day – and likely regretted it 20 minutes later. Even without accompaniment, I had seen the future of this country marching down that warm and sunny main street. 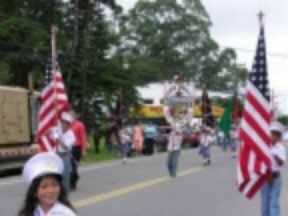 Perhaps, at some future National Flag Day in Panama, I will hear the melodic and wonderful strains of Souza’s Liberty Bell ringing in the streets of this highland community. Until that day, I feel assured that the future of this country bodes well. The bell of liberty rings loud and clear. I have seen the seeds of tomorrow and the harvest looks bright. – David Dell.